Hello. My name is Beth Ann, and I have a problem. With diaper creams. All the diaper creams. And calling my diapers by their given names. But that's a different post. When I first found out I was pregnant, I knew I wanted to cloth diaper. I also knew that in order to cloth diaper, I had to use "cloth safe diaper cream" which is basically no zinc oxide. I thought this meant that I needed to search out every nook and cranny to find these little tubes of natural goodness, so I went a little crazy. I looked everywhere, and bought a LOT. We have so much that I have been forbidden to buy any more. If you've ever seen my cloth diaper stash, you would know that I don't take "no" well, and I usually end up getting what I want anyway. Which leads me into today's post. About diaper creams. Even though I have enough to cover all the tushies of the entire Navy, I still need to buy more. We need to begin here today by talking about this packaging. LOOK at this packaging. I opened this and was immediately happy. Is it possible to get a package and not be happy though? The owner of this store, Tabatha, puts a lot of love and happiness into each of the products she makes, and you can see it through her unique and happy packaging and products. 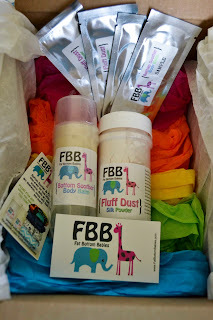 The names of her products are adorable too, she has fluff dust (bless my cloth diapering heart!) and bottom soother. How sweet do those sound? I wanted them in my stash simply because it's fun to ask my husband to bring me some Fluff Dust from the changing table. 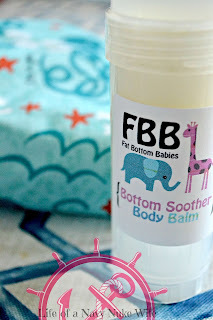 Unique to FBB is the great push up design of their diaper cream. Have you tried this in a diaper cream before? This makes it so you don't actually have to touch your kid's bum, which might be helpful if there is a bad rash. It's also a great changing table toy for little wiggly babies. I love not having to wipe my hands off on my baby's diaper before snapping it on. Wait, I'm not the only one that does that, right?! If you don't do it, you should try! I like to think that I'm a pro at cloth diaper creams. I'm pretty thoroughly obsessed with them. I've tried hundreds, and I keep about the same amount in my house at all times. I love the versatility of cloth safe cream. When my daughter wants to put extra on her knee, or if she tries to put it on her face I'm not worried about it getting in her mouth and hurting her. I let her put some on my son also (she loves putting it on his belly which results in giggles all around) and it's okay to get it outside of the diaper area. My daughter also loves having diaper cream put on her bug bites. I'm not sure if this helps her at all, but she loves putting it on. She asks every single day for me to "put some stuff on it". All of these products that Tabatha stocks are edible (although maybe not tasty) so you don't have to worry about any toxicity in their tiny little systems. If you're in the market for a new diaper cream, I can't recommend this one enough. It comes in some great scents, including Monkey Farts . . . which smells a lot better than you'd think it would based solely on first thought. Some other scents are blueberry tart, watermelon, and tea tree and lavender. I've smelled them all and I'm a fan of every last one! I think I like watermelon the best, most likely because it's July. What a great summer smell! 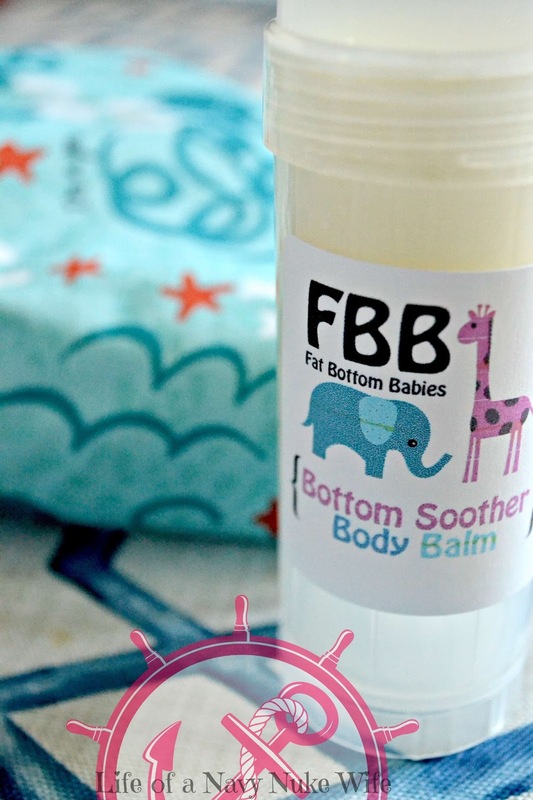 Lastly, before I leave you with the links to find these wonderful products, here is the wonderful Bottom Soother with our friend Jules, the traveling genius. She loves diaper creams too. Where to find these goodies! Please go take a look at her sites and see her fun products. There is no better way to support a working at home mother than to buy her products. This mommy is a great one to support. Do you have fun uses for diaper cream? Have you ever tried it for anything besides tushies?? These look awesome! I also would like telling my husband to grab me the 'fluff dust' lol! I love the packaging too, it's super cute! I think about me as being blessed haha! I have NEVER EVER had to use bottom creams on my baby and he is almost 4 years old! I am intrigued by this one because it is a balm and comes in a container like chapstick haha! and another thing, now I am curious to sniff the Monkey Farts hahahah No really, what a great thing for a momma to create and the fact that they are not toxic is a PLUS! The names are so cute. Too funny! These sounds like they would make wonderful baby shower gifts. Very cute packaging. I'm still fairly new to cloth diapering. I have been cloth diapering for off and on for over a year now and am still learning something new every day. I have a giveaway coming up soon for a cloth diaper that I'm pretty excited about. Thanks for the tip on the cream, I have been using sposies when he has a rash. That packaging is really adorable and appealing! I love it! The product names are just too adorable. I love this! These would be a great gift for baby showers. If/when I have another I know I want to cloth diaper. I ill have to keep this in mind. The packaging is super cute, these would make amazing baby shower gifts for my expecting friends. The names are so funny and adorable! I think I need to start planning for family just to my hands on this adorable package. The push up design is fantastic! And I agree that the names of the products are a lot of fun! The names Fluff Dust and Bottom Soothe sound so interesting and tempting! I would love to try these for my baby. Oh do I just love companies that put time and effort into their packaging!! It really makes a difference and makes a lasting impression on me!! I also am convinced that it means they put extra love into their products as well!! I will have to give them a try! !